Its now a beautiful saturday afternoon outside and I sit here in this boring room and made this post about useful palo alto commands, that can help us in case of a problem arises. With my requirements for any networking layer 3 security device I collected the basic commands that you have to know or you will not be able to troubleshoot your device. The commands show tha same things that I experienced from fortigate cisco asa and checkpoint (must admit checkpoint has not as useful cli as the others). 2.5. show interface counter – not documented, but shows more in case of interface errors. The following command shows the free Pool / Pool max values. If the left side nears to 0 then your pool is full and your firewall has heavy performance. Sorting with the second column too I see that the flow dos and the ctd sml are the smoothiest types. But what the ctd sml means? Currently it is for me 35 unknown counter. Or aspects. What is the difference between category and aspect? Palo Alto classifies the counters with severity as well. I thing the severity depends mostly on the level of the value and not just on the type. Lets see in the future if that categorisation will be useful. There is a really cool value, it is called “rate”. The “sampling time” is the time interval that was calcultated for the rate. You can test a specific traffic and check the match with the rulebase or nat or policy based routes or whatever you want. Lets see what you can define for your specific traffic. Its quite customizable, you can add more than just a source destination IP or ports or an Interface. Lets make an example with proxono application. If you check my matching rules, it will output you all matching rules. But if there is a deny first this will be the only matching rule since the firewall does a security policy lookup from top to bottom. In the rule below with tha name DMZ-Zone1-Apps-block I have used an Application filter and set the category to networking and subcategory to proxy. The firewall will put then all the applications in the rule that belongs to this categories. Warning with Application Updates! If you make an application update, this will automatically update the Application filters and adds or deletes the new apps to/from the rule that has the application filtered category. 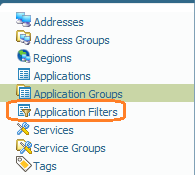 Palo Alto suggests to use Application groups instead of filter but this can be a heavy work if you have to add manually a tons of applications to a group. I would use application filters and always read the release notes for Application Updates and check if my application filters are involved with the new release or not. xml like policy can be filtered only with the command “show config running xpath“, xpath could be useful for pushed-shared-policy too. To view the running configuration use the command show running with your config part, like nat-policy. The templates are better. They can be reached in set cli mode. If you would like to present your lovely command here, jus update me! Last but not least you can monitor any of the commands output above if you want. It can be done with Palo Alto XML API. Are you interested in it? Than visit my post, Custom Monitoring of Palo Alto with Perl and Cacti. All commands are useful for an administrator as daily basis.